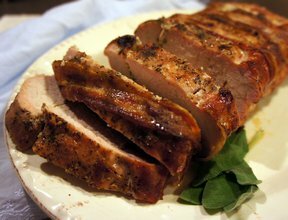 Cut the pork loin in horizontally but not all the way through so you can open like a book. Blend garlic, rosemary, thyme, mustard and oil in a small food processor, scraping down the sides of the bowl occasionally, until the garlic is minced. 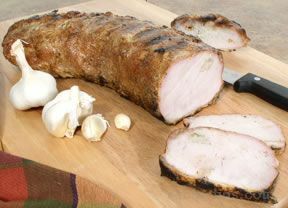 Sprinkle cut side of the pork loin generously with salt & pepper. Spread with the mustard. Sprinkle with the herb mixture. Close the loin up. Wrap the pancetta or bacon slices around the pork. Tie with kitchen twine so the pancetta or bacon will stay in place. Cover & refrigerate at least 1 hour & up to 1 day. Preheat oven 400. Pour 1/2 cup of broth & 1/2 cup of wine into the roasting pan. Add more broth & wine to the pan juices every 20 minutes. 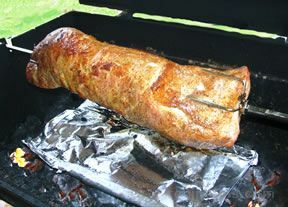 Roast the pork until a meat thermometer inserted into the center reaches 145 degrees for medium rare, about an hour. 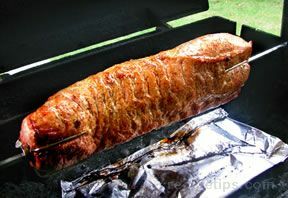 NOTE: This could also be grilled over indirect heat, for about the same amount of time.